Hanukkah (alternately spelled Chanukah), meaning "dedication" in Hebrew, commemorates the victory of a small group of Jewish rebels (led by Judah Maccabee and his brothers, collectively known as “the Maccabees”) over the armies of Syria in 165 B.C.E. and the subsequent liberation and "rededication" of the Temple in Jerusalem. Modern celebrations of Hanukkah focus on family and friends and include the lighting of the Hanukkah menorah (also called a hanukkiyah); singing and playing special songs and games (dreidel); and eating foods prepared in oil including latkes (potato pancakes), sufganiyot (jelly doughnuts), bimuelos (fried dough puffs) and keftes de prasas (leek patties). 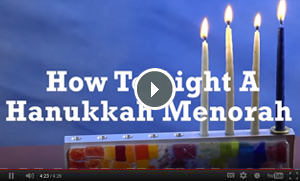 Learn how to light the Hanukkah menorah. Song Playlists to Keep You Rockin' all Hanukkah Long! Latkes are traditionally served for Hanukkah because they are cooked in oil (to commemorate the vial of oil lasting for 8 days). Scholars have offered several theories. One traces the tradition back to the decision of the Hasmoneans to mint their own nation's coins after their military victory over the Greek Syrians. What Do You Know...about Hanukkah Music? Video: 24 Million Donuts, 10.8 Billion Calories - it's Hanukkah in Israel! Hanukkah can be a time for us to rededicate ourselves to the Jewish value of tikkun olam, repair of the world. In search of a unique Hanukkah gift for the social justice hero in your life? Look no further than this guide for all your gift-giving needs.